The ultimate objective of the Indian bankruptcy reform is to get up to plausible recovery rates and change the behavior of borrowers. The key tool for achieving these objectives is reducing the delay. In the existing literature, we know that there are large delays, particularly for large firms (Bhatia et. al. 2019, Felman et. al. 2019, Shah 2018). The most important proximate objective of the Indian bankruptcy reform is to reduce delays in the bankruptcy process (Shah and Thomas, 2018). A great deal of the focus so far has been upon the average value of the delay. It is, however, important to look at the full distribution of the delay, and not just the sample mean. Box-and-whisker plots are a nice visualization tool through which we can see more than just the sample mean. In this article, we (a) Construct a visualization of a key output measure for the Indian bankruptcy reform: a box-and-whisker plot for the delay associated with Resolved and Liquidated firms; and (b) Argue that this output measure is likely to get worse in coming days. Sometimes, it is argued that the right way to measure the delay is to exclude certain elements of the delay, which is not correct seen from first principles. The fundamental fact about distressed firms is that every day of delay reduces recovery rates and hampers economic dynamism. For an analogy, a sick animal is unproductive and suffers, regardless of whether the vet takes the weekend off or not. Let's start at the right column (for resolved cases). The bottom pane shows that 79 firms were resolved. The upper pane depicts the range of values for these firms. The black horizontal line is the median, and the box is drawn from the 25th to the 75th percentile values for the delay. The dots show the most extreme values. A key finding here is that the median resolved case took more than 270 days (the horizontal red line). When we look at the liquidated cases, things are slightly better. The black line -- the median delay -- is close to 270 days. It still says that half of the liquidated cases took more time than the legal limit of 270 days. A little under 25 percent of the liquidation cases reached their conclusion in 180 days, while very few of the resolved cases concluded within 180 days. But more than 50 percent of the liquidation cases concluded within the 270 days limit, while a little more than 25 percent of the resolved cases were done by this time. These two pictures -- the box-and-whisker plots for resolved and liquidated cases -- are a nice visualization of a key output measure of the Indian bankruptcy reform. The trouble is, so far, we have seen only 79 + 304 cases reach the conclusion. These statistical estimates are censored: the cases that have finished are likely to be the ones where the IBC fared relatively well. The bulk of the action is in the Ongoing cases, and there are over 900 of them. For these, the median delay is already in the region of 270 days. The box-and-whisker plots for Liquidated and Resolved cases, which is the output measure of the Indian bankruptcy reform, will be modified in the future based on cases emerging out of the Ongoing bucket. Very crudely, we may conjecture that if all the ongoing cases finish tomorrow, the 25th and 50th and 75th percentile values of the overall distribution will be much like those seen as of today with the Liquidated and Resolved cases. But this is an over-optimistic scenario. In fact, cases will only trickle out in the future with higher delays, cases where the median delay has already reached about 270 days. Therefore, as cases emerge out of the Ongoing bucket in the future, the box-and-whisker plots for Liquidated and Resolved cases are going to get worse. How might the output measure evolve in the future? 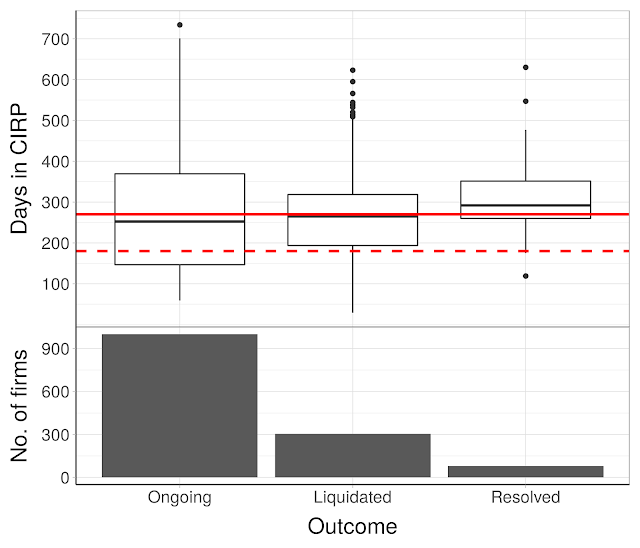 The most interesting question before us is: In the future, when Ongoing cases trickle out into completion, how will the output measures (the box-and-whisker plots of Resolved and Liquidated cases) shape up? To help visualize what comes next, we create the box-and-whisker plots for the Ongoing cases by quarter, from Q1 (Jan to Mar) 2017 to Q4 (Oct to Dec) 2018 in Figure 2. The x-axis shows the quarter in which cases were admitted into the IRP. The top pane of the graph shows the box-and-whisker plot for the days in IRP for the Ongoing cases only (those which have not concluded as of Dec 2018) and the bottom pane shows the number of firms. 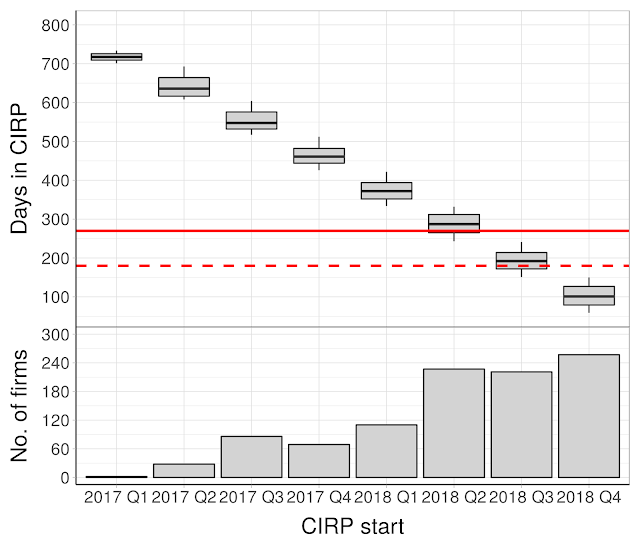 The graph for the number of firms shows that a large fraction of the Ongoing cases has started their IRP in the last three quarters of 2018 -- between April to December 2018. Among these three quarters, there is a near split of about 33%-33%-33%, between cases that have spent more than 270 days, between 180 and 270 days, and below 180 days. To some extent, these results are mechanically driven by the facts of the time. But the results are remarkable nonetheless. As an example, the (few) pending cases from Q1 2017 have already spent over 700 days of delay! When these cases complete, they will push the outcome measures in an adverse direction. On the other hand, a good number of cases are in 2018 where, so far, the delay that has been clocked is relatively low. 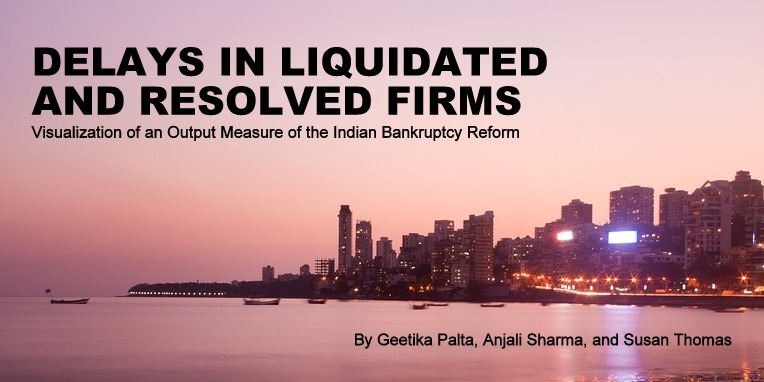 If hypothetically, the Indian bankruptcy reform suddenly works better, then a slew of cases can complete, and then the outcome measure may even improve. The box-and-whisker plot of the delay (measured in calendar days) for Resolved and Liquidated firms is a nice visualization of a key output of the Indian bankruptcy reform. It shows a gloomy picture, where over half of the delays are worse than the outer limit in the law of 270 days. Looking into the future, based on the delays already incurred with Ongoing cases, the output measure is likely to get worse. The authors are researchers at the Indira Gandhi Institute for Development Research, Mumbai. 1. Time to resolve insolvencies in India, Surbhi Bhatia, Manish Singh, Bhargavi Zaveri, The Leap Blog, 11 March 2019. 2. The RBI-12 cases under the IBC by Josh Felman, Varun Marwah, Anjali Sharma, 2019 (forthcoming). 3. Sequencing issues in building jurisprudence: the problems of large bankruptcy cases, Ajay Shah, The Leap Blog, 7 July 2018. 4. The Indian bankruptcy reform: The state of the art, 2018, Ajay Shah, Susan Thomas, The Leap Blog, 22 December 2018. This article was originally published at Dr. Ajay Shah's LEAP Blog on March 30, 2019. All rights reserved by the original publisher.